Smart water flooding as a developing technique utilizes modified water chemistry in terms of salinity and composition to prepare the best-suited brine composition for a specific brine/oil/rock system to obtain higher oil recovery efficiency. Huge amount of unrecovered oil is expected to be remained in carbonate reservoirs; however, few research works on incremental oil recovery during smart water injection in carbonate cores at reservoir condition are reported. Several core flooding tests using one of the Iranian carbonate reservoir rock are conducted to check the effectiveness of smart water injection for more oil recovery efficiency. The results reaffirm the positive effect of sulfate ions to play a key role for better smart water performance. Moreover, it was concluded that the calcium ion concentration is not as effective as magnesium ion for the tests performed at reservoir condition. Synthetic sea water (high-salinity) flooding was considered as the base scenario which results in almost 63% oil recovery efficiency for secondary recovery scenario. Formation of micro-emulsions was found to be the main reason of additional pressure drop during low-salinity water flooding. This clearly showed that the diluted smart water injecting increases the ultimate oil recovery up to 4–12% for already water-flooded carbonate reservoirs. 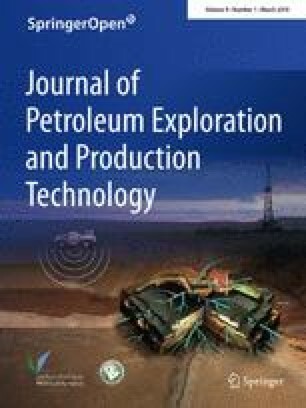 Many researchers have focused on the impact of injecting brine chemistry for more oil recovery from depleted oil reservoirs. Very firstly, positive impact of fresh water injection on oil recovery was observed in sandstone reservoirs and it was believed that emulsification and clay swelling might be the main mechanisms (Bernard 1967; Martin 1959). Later, impact of changing brine composition on oil recovery was studied and it was concluded that brine composition may affect the ultimate recovery (Jadhunandan and Morrow 1991). It is widely accepted that wettability alteration is one of the main mechanisms for enhanced oil recovery as the trapping and fluids distribution would be affected by wettability (Anderson 1986b, 1987a, b; Strand 2005). Since the oil recovery was improved for weakly water-wet conditions, modification of rock wettability was believed to be the key mechanism of oil recovery by changing the brine composition (Jadhunandan and Morrow 1995). Crude oil type, brine composition, connate water saturation, and aging temperature were believed to be important in wettability alteration (Morrow 1987; Tang and Morrow 1996; Yildiz and Morrow 1996). Additionally, fine detachment is considered to be a mechanism of improving water-wetness of the system which can result in higher oil recovery (Yildiz and Morrow 1996). It is estimated that 80–90% of the world’s carbonate reservoirs are not water-wet (Anderson 1986a, 1987a). For the reason that carbonate reservoirs are naturally fractured, it is very challenging to recover the remaining oil in the matrix blocks, as water cannot be imbibed due to the negative capillary pressure effect. Therefore, early water production occurs and most of the reserved oil remained there which becomes unrecovered (Hognesen et al. 2005). Since carbonate reservoirs are mainly oil-wet, the wettability changes toward more water-wet state would lead to higher oil recovery. Different mechanisms have been proposed for incremental oil production during low-salinity water flooding (LSWF) into the reservoirs (Sheng 2014). Detachment of fine mixed-wet particles may lead to a more water-wet condition and a rise in oil recovery (Berg et al. 2010; McGuire et al. 2005; Tang and Morrow 1999). Derjaguin–Landau–Verwey–Overbeek (DLVO) theory is implemented for detachment of fine particles in LSWF, and fine detachment takes place whenever the injected brine salinity is lower than or equal to the critical flocculation concentration (Lager et al. 2006). Additionally, rock dissolution is a possible mechanism for enhanced oil recovery toward low-salinity water flooding (Lager et al. 2006; Pu et al. 2010; Zaeri et al. 2018a). Moreover, anhydrite dissolution in sea water injection leads to in situ sulfate ion generation; hence, the wettability would be altered (Yousef et al. 2012). The chance for water-in-oil (w/o) emulsions increases during water injection into the reservoirs, where the droplet size distribution of emulsions depends on the salinity and composition of the injected brine. (Maaref and Ayatollahi 2018; Maaref et al. 2017). Therefore, the formation of w/o emulsions could affect the oil production once the brine chemistry has been manipulated. Composition, salinity, and pH of the brine affect the surface charge of rock and fluid interface. Therefore, the chemistry of formation water is also important as it influences the rock wettability property. Presence of multivalent cations in the brine may affect the wettability state of the rock during smart water flooding (Austad et al. 2010; Fathi et al. 2010; Lashkarbolooki et al. 2017; Yousef et al. 2011). Many research works have been conducted on chalk reservoirs, and it is concluded that fluid solutions with the composition of sea water react with the surface of the chalk; thus, a more favorable wettability state would be achieved as more water-wet state result in having additional oil recovery (Austad et al. 2005, 2010; Strand 2005; Tweheyo et al. 2006b). Opposite results have been published for the impact of presence/absence of monovalent ion. Some researchers believe that removing non-active salt, NaCl, from the composition of the injected sea water, the oil recovery by spontaneous imbibition was improved in carbonate rocks up to 10% of OOIP compared to sea water injection (Fathi et al. 2010). However, some others believe that the wettability alteration process during smart water flooding into carbonate reservoir is more affected by monovalent ions compared to divalent ions. It is also reported that the presence of KCl can change the wettability states from strongly oil-wet to strongly water-wet. Moreover, by decreasing NaCl concentration, more wettability alteration was obtained (Lashkarbolooki et al. 2017). Mechanism(s) of wettability alteration by smart water injection was studied and concluded that Ca2+, Mg2+ and SO42− alter the wettability of carbonate surface at different temperatures. It was also reported that SO42− only has a catalytical role and also reduces the positive surface charge (RezaeiDoust et al. 2009). So, relative amount of divalent ions was reported to be an important parameter in oil recovery from smart water injection. Al-Attar et al. (2013) conducted core flooding tests on carbonate plugs from Bu Hasa field. They injected sea water and field produced water to examine the effect of brine composition and salinity on oil/brine/rock system. They concluded that increasing Ca2+ concentration decreases the oil recovery while increasing SO42− concentration in the injected brine leads to incremental oil recovery. This increase in oil recovery is attributed to the wettability alteration toward more water-wet condition (Al-Attar et al. 2013). 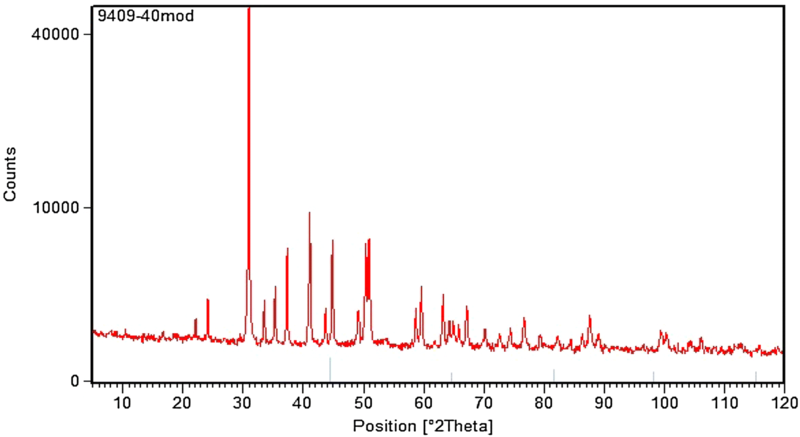 Other studied have also reported the positive impact of increasing SO42− concentration on oil recovery (Awolayo et al. 2016). The influence of sulfate ion on the interactions between fatty acids and carbonate surface was also studied, and it was concluded that SO42− changes the wettability of carbonate surface to a more water-wet state by displacing the pre-adsorbed fatty acids from the calcite surface (Gomari et al. 2006). Concentration of Mg2+, which can displace adsorbed carboxylic groups, is also found to be an important factor in wettability alteration (Karimi et al. 2015). As a result, both positive and negative effect for the presence of divalent ions have been reported in the literature (Awolayo et al. 2016; Fathi et al. 2010, 2011; Karimi et al. 2015; Lashkarbolooki et al. 2017; RezaeiDoust et al. 2009; Zaeri et al. 2018b). So, a more comprehensive study is needed to be performed to understand the impact of changing the relative amount of different divalent ions at reservoir condition. It seems that performing the aforementioned tests at reservoir condition would resolve part of the contradictory results reported by different researchers. Main candidates for smart water flooding in middle-east are the carbonate reservoirs which might be water flooded with higher salinity brine for a period of time. Moreover, it has been reported that the positive impact of low salinity water flooding might be reduced or deleted if the process is going to be in tertiary mode. So, the main idea of this paper is to evaluate the performance of smart water flooding in tertiary mode. This research work is aimed to assess the performance of smart water performance at reservoir condition using experimental tests. Besides, by conducting a series of experimental tests, the effect of relative amounts of determining ions was studied. Additionally, impact of removing sulfate, calcium, monovalents and divalents ions were aimed to be evaluated by running different tests. Moreover, more tests are performed to investigate different scenarios of a low-salinity water flooding process (secondary or tertiary) on ultimate oil recovery efficiency. 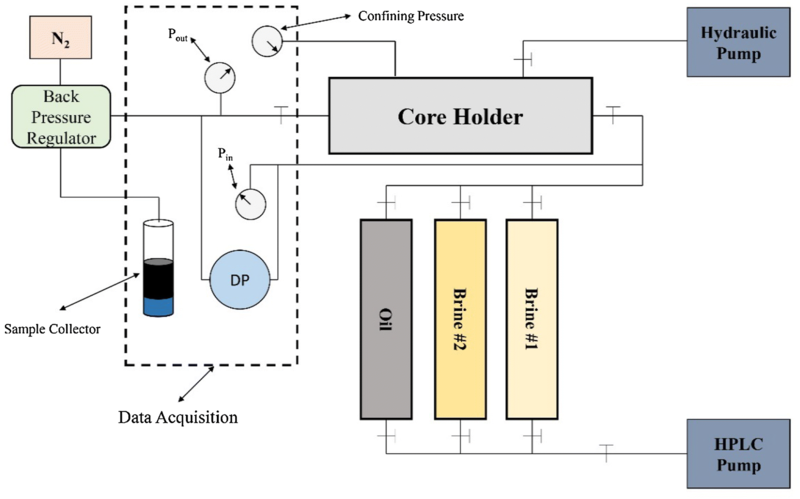 In order to investigate the effect of injection brine chemistry on oil recovery, several core flooding experiments were designed. Core flood experiments were performed with the focus on the effect of determining ions contribution or exclusion on oil recovery efficiency. Therefore, different scenarios were adopted to study the effect of composition and salinity of the injection brine on oil recovery efficiency. Eight plug samples with approximately similar properties were selected from the mentioned tight oil reservoir with the lengths ranging from 6 to 9 cm. Core specifications are shown in Table 1, which show very low permeability cases. Moreover, a number of thin sections were prepared to assess the wettability changes of samples using contact angle measurements before and after the aging process. In order to prepare the plugs for the main tests, the following procedure was followed. In the first stage, the selected plugs were placed in Soxhlet extractor and Toluene was used to clean the cores. The plugs were dried in oven; then, dry weight measurement was performed. In the next step, all the plugs were saturated with the formation water (FW) at the rates of 0.05, 0.1, 0.2 and 0.5 ml/min to ensure that the core is fully saturated. Each injection rate was performed continuously until constant pressure difference was obtained across the plug. Once this was achieved, the injection rate was then increased to the next level. The capillary number for the specific injection rates was measured to be 1.07e−7 for injection rate of 0.1 ml/min. Next, the plugs were kept in formation water solution for 5 days in order to ensure that they are completely saturated with the formation water. Afterward, each core was then flooded with crude oil from one of the Iranian south oil reservoir with the same injection rate, the same as they were saturated with FW. Then, all the plugs were placed in crude oil and aged for 30 days at 90 °C. Synthetic sea water (SW) solution was selected as the base composition, and all other brines were designated by changing the SW composition. The solutions composition presented in Table 2 shows that the ionic strength has been kept constant for all solutions by adding/removing non-active salt content (i.e., NaCl). Besides, TDS, viscosity and pH of solutions were also measured and presented in this table. The diluted solutions were prepared using distilled water added to the main solution. All solutions were stirred for nearly 1 h to ensure complete dissolution of salts; then, they were kept in closed bottles to prevent vaporization. In this study Ca2+, Mg2+ and SO42− are assumed to be potential determining ions; therefore, the name of each solution is taken from the concentration of these ions compared to SW. For example, Ca.2S.4 Mg refers to the solution with the concentration of Ca, S and Mg, varied by one, two and four times, compared to sea water, respectively. If one ion is excluded from the solution, then it has been shown by zero. Besides, the diluted solutions are distinguished from other solutions such that SW.10D refers to ten-times diluted sea water solution. At this stage, core flooding tests were performed using different scenarios at 90 °C and overburden pressure of 1500 psi. The tests were done with injection rate of 0.1 ml/min. This injection rate was selected as it refers to 0.41 ft/day linear velocity injection to mimic the field condition. Once the oil production was ceased, higher injection rates (0.3 and 0.5 ml/min) were selected to ensure about minimal capillary end-effect and no additional oil production was observed with higher injection rates. A back pressure regulator was also utilized there to maintain the core pressure at 1000 psia. A schematic view of core flood apparatus is presented in Fig. 2. Two plugs with most similar properties were chosen to evaluate the repeatability of the tests. An overview for the mentioned scenarios is shown in Table 3. This table illustrates the scenarios performed to investigate smart water performance for flooding tests into carbonate rocks. In some cases, when the oil production was ceased, the next injection scenario was performed in order to investigate the incremental oil recovery. The density and viscosity of synthetic sea water was 1.032 gr/cc and 1.10 cp, respectively. As it is indicated, the pH was maintained almost constant for the tests to prevent its effects on the oil recovery efficiency. Moreover, crude oil properties are shown in Table 4. High pressure high temperature contact angle measurement apparatus (VIT 6000) was used for wettability assessment at reservoir condition, and the results are shown in Table 5. In this table, original, initial and final contact angle represents the value of contact angle before aging with crude oil, after aging with crude oil for 4 weeks and after spontaneous imbibition with synthetic brine (Mehraban et al. 2017). In order to investigate the possible formation of water-in-oil (w/o) emulsions, emulsion stability tests were conducted. These tests were performed to evaluate the impact of brine dilution on the formation and stability of the emulsion. Therefore, the water samples of SW and SW.10D (as referred in Table 2) were used at oil/water ratio of 4:1 for the following tests. To prepare the solution, brine was added to the oil by one droplet a time; then, solution was mixed for 20 min using a magnetic stirrer at 1000 rpm. For each test, an emulsion sample was taken after 0, 3, 7, 24, 48 and 72 h to capture any variation in the emulsion droplet size distribution accurately. Besides, the samples from bottom, middle and top of the container were obtained for each test and several images were taken for their analysis. A high resolution microscopic camera (HLOT) with a zoom of 500 × was used for taking the images. Moreover, a backlight (LED panel light) was used to enhance the quality of the images and ImageJ software was used for image analysis. Different scenarios were performed on carbonate plugs, and the oil recovery performances were compared. The highest oil recovery from a single scenario is obtained for the 10-times diluted sea water solution. As it is illustrated in Table 6, all of the cores have almost the same petrophysical properties and initial water saturation is the almost the same for all of the plugs. In the first test, a solution of 4Ca.S.2 Mg was injected after monovalents, while in test #2, the effect of sulfate ion was investigated by injecting the solution of Ca.2S.4 Mg after Ca.0S.4 Mg injection. Ultimate residual oil saturation was found to be 31% for this test. The results of test #3 show the effect of injecting water dilution on the oil recovery factor. 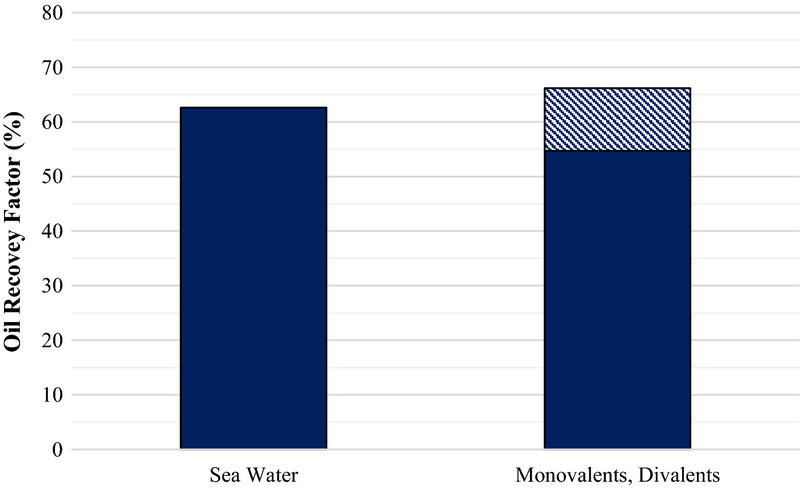 It was observed that injecting sea water results in higher oil recovery efficiency compared to the injection of monovalents or for the solution in which the sulfate ion was removed. The experimental results showed almost 12% higher oil recovery efficiency for the diluted sea water injection case (#3) and the ultimate residual oil saturation reduced to 20%. The same scenarios were performed for the test #4 to validate the results obtained for the previous test. Promising result was again obtained, and repeatability of the results was proved. The effect of dilution was also investigated in test #5, and the minimum additional oil recovery among diluted cases was recorded. Ultimate residual oil saturation for this case (Ca.4S.2 Mg and Ca.4S.2 Mg.10D) was 36%. In test #6 (0Ca.S.4 Mg), Ca2+ is excluded from the injecting brine composition while Mg2+ was increased by a factor of four compared to the SW case. The recovery factor was found to be the same as SW flooding, and no considerable change was observed. In test #7, the effect of starting time of the injection of diluted brine into the carbonate plug was investigated and ultimate residual oil saturation was as same as the test #3 and test #4. 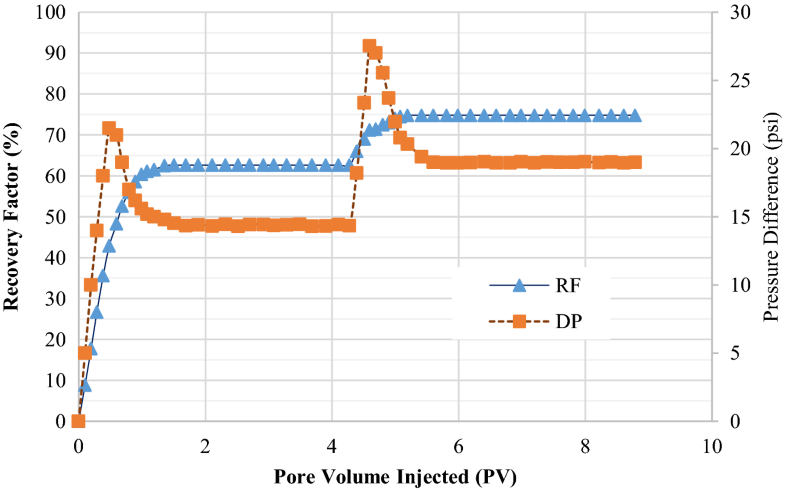 During test #8, the effects of divalent ions were examined and it was concluded that the presence of divalents affect the performance of smart water injection process, significantly. Almost 11% additional oil was recovered, and the ultimate residual oil saturation was found to be about 26% for this test. Repeatability of the tests are shown in Fig. 3, where it shows that the test results indicate reasonable repeatability. The results of recovery factors are also shown through different graphs in Fig. 4. 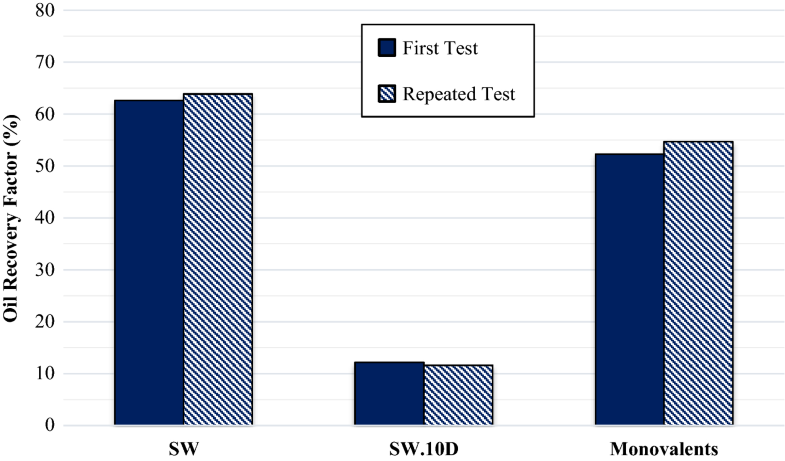 This figure illustrates that injecting 10 times diluted SW (SW.10D) in secondary mode is the best scenario for the set of tests performed on rock/oil/brine system in this work. On the other hand, it can be observed that the impact of the sequence of low-salinity water injection on ultimate recovery factor is not significant if enough amount of each brine is injected (in this case, more than four PV of each brine was injected). For example, the results for tests #3 and #7 show that the ultimate oil recovery factor for secondary and tertiary LSWF were 76% and 74%, respectively. Comparing the results for tests #2 and #3 showed that by removing SO42− from the injecting brine, the oil recovery factor was reduced from 63% for SW injection to 49% which indicate the positive impact of sulfate ion for oil recovery during smart water flooding in carbonate reservoirs. The effect of removing divalent ions (Ca2+, Mg2+, SO42−) from injecting brine has been evaluated during test #8 which showed that the oil recovery factor reduced to 54.7% in this case. Besides, injecting different brines containing divalent ions in other cases resulted in higher oil recovery factor up to 66%, which proves that the divalent ions are the determining ions for smart water flooding process. Dilution of injecting brine was studied in different scenarios (tests #3, 4, 5) which clearly resulted in significant increase in incremental oil recovery between 4 to 12 percent. Mineral dissolution, multi-component ion exchange and double-layer expansion are expected to be the main mechanisms here (Etemadi et al. 2017; Lashkarbolooki et al. 2014, 2017) which will be discussed later. The results of emulsion stability analysis tests for different brines with different salinities are discussed in this section. Figure 5 shows the captured images from these solutions at different times. The results presented in Fig. 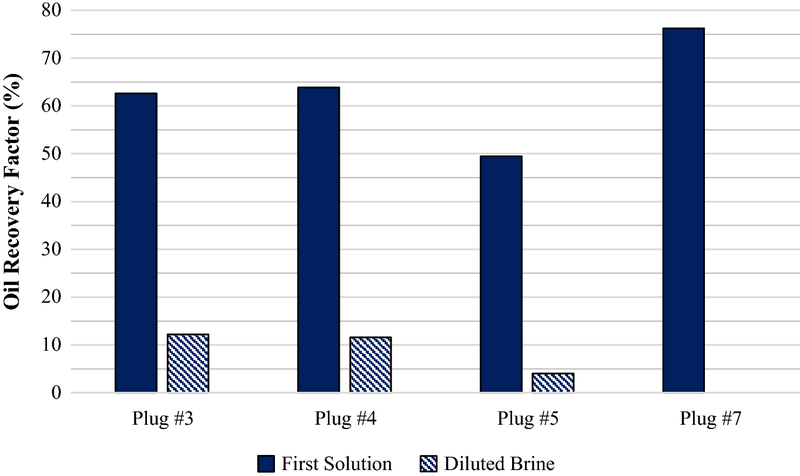 5 indicated that the solutions with diluted brine have higher numbers of emulsion droplets compared to SW, regardless of its contact time. 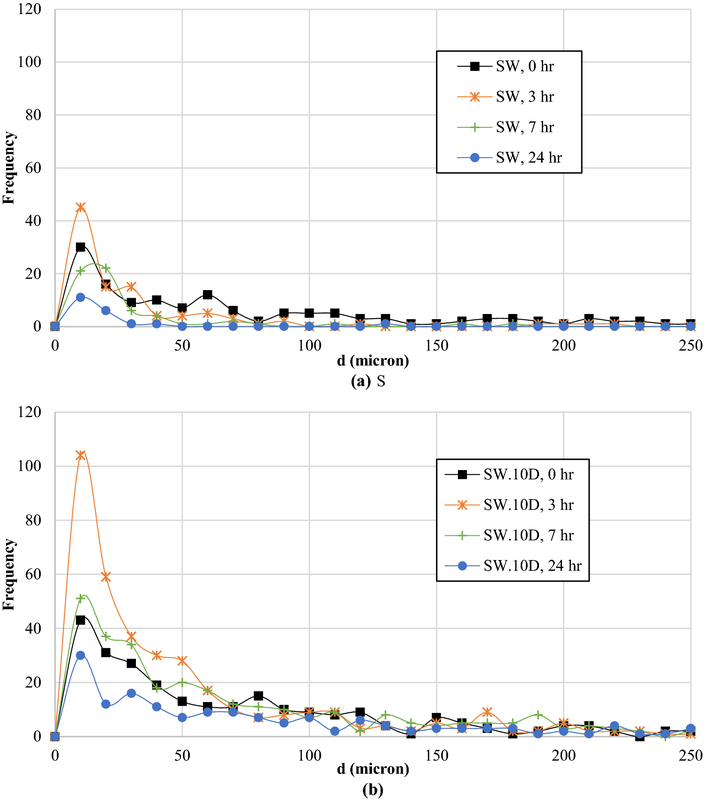 Moreover, the emulsions of SW.10D were observed to be still stable even after 24 h. Additional information on stability of emulsions could be obtained from Fig. 6 where images (from Fig. 5) are processed and analyzed, accurately. As it is illustrated in this figure, the number of emulsion droplets for SW.10D after 0 h (just after the mixing process) are much higher compared to the SW sample. After 3 h, the number and size of droplets are still much greater for the solution with SW.10D. 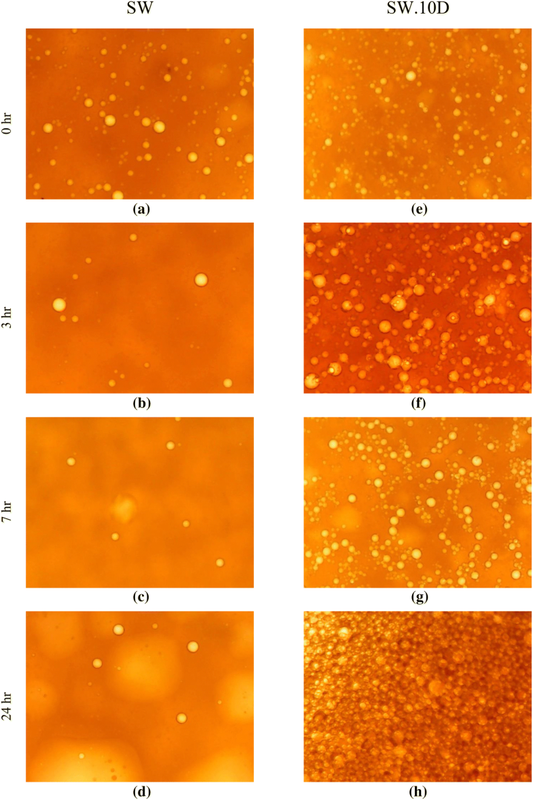 More specifically, not only the size of emulsion droplets is improved compared to the initial time, but also the number of emulsion droplets is increased. These results are consistent with the study performed by Maaref and Ayatollahi which concluded that decreasing the amount of NaCl and TDS of the brine would result in higher stability of formed emulsion droplets because of lower rate of aggregation and coalescence (2018). The analysis showed that almost all of the emulsion droplets formed were collapsed for SW case after 24 h. However, a significant number of droplets are still visible for the SW.10D case at the same time period. Therefore, as the positive charge is decreased (in the presence of SO42−), Mg2+ can reach the surface easier. As a result, carboxylic groups can be detached from the rock and the process of wettability alteration is initiated. As chloride is not a potential determining ion (PDI), Cl− cannot play the catalytic rule, as sulfate does in test #3. Similar to Cl−, Na+ is not shown to be active in the electrostatic charge alteration of the surface (RezaeiDoust et al. 2009; Tweheyo et al. 2006a). Interestingly, the results of contact angle tests support this claim as well. The positive impact of presence of SO42− could be also observed in contact angle measurements where they are observed to be 131 and 22 for Ca.0S.4 Mg and Ca.2S.4 Mg, respectively. These values indicate that when SO42− was present, the wettability of the thin section is much more altered toward a more water-wet state. Comparing the injection scenarios of Ca.4S.2 Mg (test #5) and SW indicates that oil recovery significantly depends on the relative amount of PDIs. As mentioned earlier, SO42− reduces the net positive charge of the surface and aids the positive divalent ions to remove carboxylic group with negative charges from the surface (RezaeiDoust et al. 2009). The final contact angle for Ca.4S.2 Mg and SW were 56 and 41, respectively. However, if the relative amount of negatively charged sulfate ion increases considerably, the symbiotic interactions of active ions and carboxylic groups will result in lower oil recovery factor. During the test #5, the concentrations of sulfate and magnesium were increased by a factor of 4 and 2, respectively, while calcium concentration and ionic strength have not changed. In this test, the recovery factor was reduced to 49%. Therefore, it is concluded that not only the presence of these ions, but also the relative amount of PDIs would significantly affects to ultimate oil recovery factor. Test #7 was performed to check the effects of LSWF, as SW.10D was injected. The TDS of this solution was about 4000 mg/l, and therefore, the mechanisms related to LSWF were expected to be dominant. pH was greater than 7, and it was expected that dilution may enhance the oil recovery for this rock/brine/oil system (Chen et al. 2018). The results showed that the oil recovery was increased compared to SW injection, because of the “salting in” effect, and carboxylic group and polar compounds in the oil tends to be dissolved in the aqueous phase (RezaeiDoust et al. 2009; Sheng 2014). This favors the rock surface to become more water-wet, which resulted in more oil recovery efficiency. Moreover, as reported by Mahani et al. (2016), low-saline water has a lower ionic strength compared to SW. This would make the electrical double layer to be more expanded. Then, water film on the rock surface would be more stable and a more water-wet condition is obtained (Mahani et al. 2016). Besides, higher pressure drop was also recorded during the injection of low-salinity brine compared to SW. As oil and water viscosity are almost constant during this process, this is going to be further evaluated as it may refers to fine migration (Nasralla et al. 2011; Pu et al., 2010). If fine particles are released from the rock surface, small pore throat might be blocked and new path would be created. So, higher pressure dropped would be expected (Sheng, 2014). Also, pH value of the effluent stream was slightly increased (pH = 8.4) in second cycle of test #3 (SW.10D), and it could be the result of carbonate dissolution or cation exchange (Lager et al., 2006). Equations 3 and 4 illustrate the proposed reactions by Lager et al. Another point to mention is that as it is illustrated in Fig. 8, the starting time (production mode) of injecting diluted brine is not the only important factor, once great amount of brine is injected. The ultimate oil recovery for test #3, test #4 and test #7 are 74.80, 75.47 and 76.21%, respectively. Therefore, it can be concluded that the ultimate oil recovery factor of a low-salinity brine injection process is more related to the relative amounts of determining ions and the injection brine composition. In the tests related to plugs #3 and #4, SW.10D is injected when oil production during SW injection was completely ceased. Also, double-layer expansion and salting in effect would make the surface more water-wet and incremental oil recovery is expected. As it has been pointed out earlier, by injecting low-saline brine, higher pressure drop was observed. For example, in the case of test #4, the pressure difference (DP) during the sea water injection was observed to be 29.9 psi, while for 10-times diluted sea water a value of 37.8 psi was recorded as the maximum pressure difference. An increase in DP is attributed to the permeability reduction because of the micro-emulsion formation as it relaxes after almost one pore volume of injection at both two cases (Maaref and Ayatollahi 2018; Maaref et al. 2017). As it is illustrated in Fig. 6, the size and number of emulsions are greater for diluted brine compared to SW. Therefore, higher pressure difference for SW.10D compared to SW could be due to the fact that the formed emulsions are more stable. In these two cases (tests #3 and 4), recovery factor of almost 12% has been observed for tertiary recovery during diluted sea water injection. Figure 9 shows the recovery factor and pressure difference across the core for test #3 in which SW and SW.10D are injected. In test #5, after injecting Ca.4S.2 Mg (Ca.4S.2 Mg).10D has been injected and higher oil recovery factor (ultimate recover factor = 53%) was recorded due to the low-saline water injection. This low amount of increase in recovery factor (4%) compared to the SW.10D injection could be due to the higher relative amount of [SO42−]/[Mg2+] compared to SW.10D, and the disturbance in the wettability alteration. More specifically, as Mg2+ is the most important ion to remove carboxylic groups from the surface (Rashid et al. 2015) and SO42− plays the catalytic rule (RezaeiDoust et al. 2009), decreasing the relative amount of [Mg2+]/[SO42−] resulted in lower release of carboxylic groups from the surface compared to SW injection. Additionally, in the second cycle of this case the pH value of effluent brine was 9, which shows an increase compared to the injection brine (pH = 8.7). Comparing the results of tests #1 and #3 indicates that the injection of monovalent ions reduces the oil recovery compared to the case of SW injection (which contains both divalents and monovalents). The final contact angle for monovalents was 156, while it is 52 for the divalent ions. The ability of SO42− (which is contained in SW) to change the surface wettability to a more water-wet condition leads to a better performance in SW injection compared to monovalent injection. Besides, although Na+ is in the electrostatic layer, it is not highly active on the surface. Therefore, the ability of Na+ to change the wettability toward a more water-wet condition is less than divalent ions and potassium. So, it could be concluded that monovalent solution was not as capable as SW in order to change wettability and make the surface more water-wet. Accordingly, oil recovery in monovalent ions injection scenario was lower than SW injection as it was expected (Rashid et al. 2015). For the second slug in test #1, compared to SW, Ca2+ and Mg2+ concentrations have been quadrupled and doubled, respectively. As it is already shown in Fig. 10, a value of 5.8% incremental oil recovery was recorded for this solution. It is postulated that the monovalent ions from the previous slug have completely surrounded the surface and higher amount of SO42− is needed to aid the wettability alteration. But, as SO42− concentration was not changed and the injecting brine was only diluted, divalent cations cannot remove the carboxylic groups from the rock surface and lower oil recovery was observed compared to sea water. On the other hand, in test #8, it was observed that by injecting divalent ions, a high value of 11.5% additional oil recovery was observed after monovalent injection. 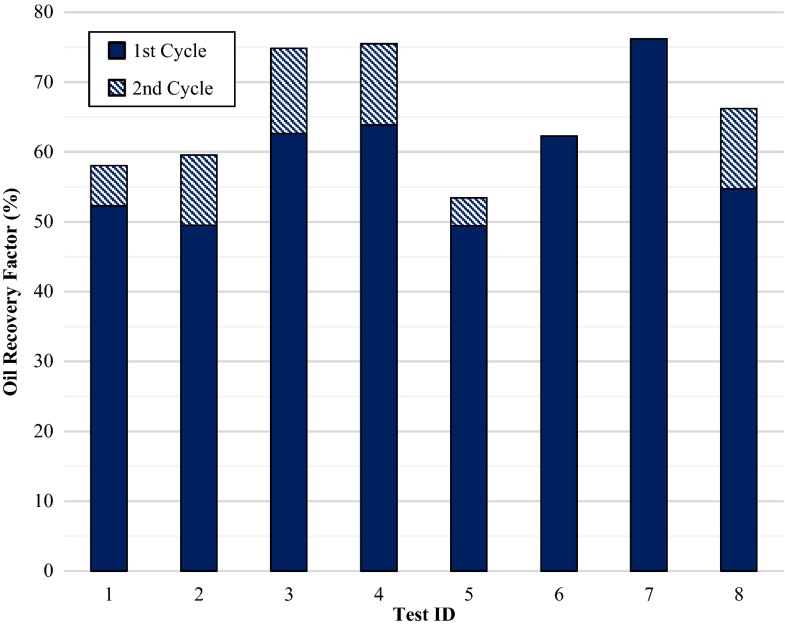 The difference between the second cycles in the test #1 and test #8 could be referred to the relative amount of SO42− in the corresponding brines. If sulfate content is high enough to reach the rock surface and reduce the net negative charge, divalent cations are capable of detaching carboxylic groups from the surface and making the surface more water-wet (Fathi et al. 2010; RezaeiDoust et al. 2009). Another point is that Na+ content of injected solution in test #1 competes with divalent cations and reduces the ability of PDIs to remove carboxylic groups from the surface. In test #6, Ca2+ was removed while magnesium content has been quadrupled (0Ca.S.4 Mg). In this case, Mg2+ and SO42− would act simultaneously in the porous media and favor the wettability alteration. As it is proposed by Karimi et al. (2015), Mg2+ would substitute Ca2+ and aid the wettability alteration by removing carboxylic group from the surface (Karimi et al. 2015). The chemical reaction related to wettability alteration of smart water in presence of Mg2+ and SO42− is presented before (Eqs. 1 and 2) which shows that these ions participate in a chemical reaction which makes the wettability of the rock to be altered. Additionally, as there is no Ca2+ in the injection brine, mineral dissolution might be occurred and calcium would be dissolved from the rock and will be transported to the aqueous phase (Zaeri et al. 2018a). As carboxylic groups are attached to the calcium, the surface would be more water-wet. Moreover, in this temperature (90 °C), Mg2+ is more active than Ca2+. Hence, it is expected that the absence of calcium ions in the displacing fluid does not affect the oil recovery factor, significantly. This has been confirmed through the result obtained from test #6. 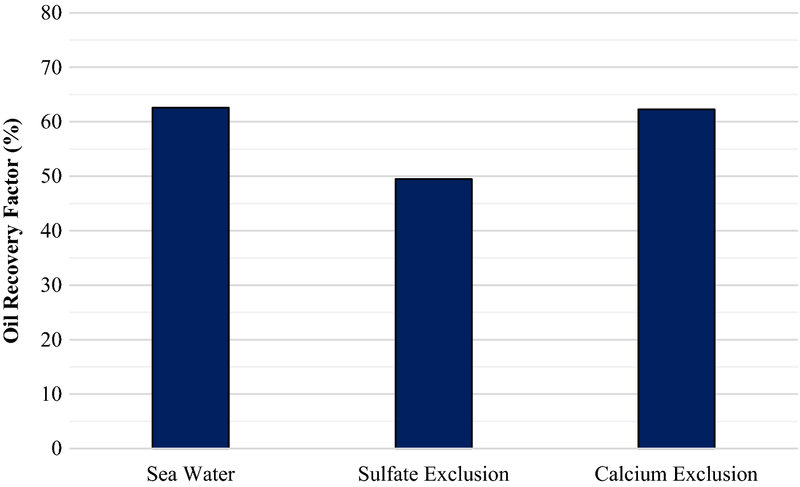 The impact of calcium and sulfate exclusion is presented in Fig. 11. The impact of LSWF in carbonate reservoir was proved in this study through core flooding tests (tests #3, #5 and #7). Based on experimental results performed at this work using SW, injecting low-saline brine as an EOR method results in higher oil recovery factor compared to high saline brine. However, the amount of incremental oil recovery depends of the composition of injection slug, considerably. An increase in the pressure difference was observed during injection of low-saline brine which is attributed to formation of micro-emulsions. Analyzing emulsion stability tests showed that the formed emulsion droplets were more stable once the brine is diluted. In addition, a greater number of droplets were formed with SW.10D compared to SW. It has been observed that presence of Mg2+ ion in injecting brine would affect the ultimate oil recovery much more than Ca2+. Results obtained from the performed conditions (high pressure high temperature) showed that even by removing Ca2+ from the injection solution, the oil recovery factor was not affected significantly. It was observed that the presence of divalent ions is a key factor for recovery improvement. As it was observed in the results of contact angle measurements as well, removing monovalent ions from the brine assists the wettability alteration process to be more successful toward a more water-wet condition. On the other hand, removing SO42− from the injection solution leads to lower oil recovery compared to sea water injection, while removing monovalent ions from the injecting brine might result in higher ultimate oil recovery compared to SW. The ratio of [SO42−]/[Mg2+] could be the controlling parameter for the wettability alteration process. It has been observed that by increasing sulfate content, oil recovery factor does not necessarily increase (test #5). Hence, this ratio should be tuned well in order to achieve more oil recovery by aiding the wettability alteration process. The authors are grateful to the members of EOR Research Center of Shiraz University for their kind collaboration in this study. Ms. Leila Hashemi is also thanked for her assistance in emulsion stability tests.